Mo Farah's chances of running at the Commonwealth Games will become clearer on Wednesday. Farah, 31, pulled out of last weekend's Diamond League event in Glasgow after he was taken to hospital with illness. He is due to run at Sunday's London Anniversary Games. "He has a big session on Wednesday that will decide whether he is fit to come to London and push on to the Commonwealth Games," UK Athletics chief executive Niels de Vos said. Farah was admitted to hospital in the United States with abdominal pains at the start of the month, but, after further tests in the United Kingdom, was given the all-clear to resume training. He is currently at his French training base in Font Romeu and is scheduled to run two miles at the Anniversary Games this weekend. 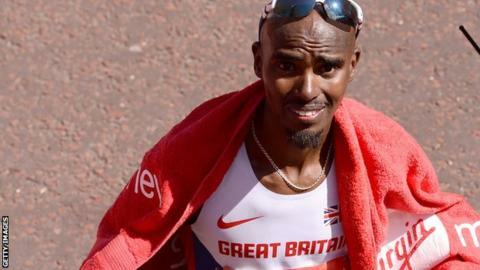 Asked on BBC Radio 5 live on Monday if he was going to be fit for Glasgow 2014, Farah replied: "It's a good question. I don't know." Farah is due to compete for England in the 5,000m and 10,000m at the Commonwealths, which start on 23 July. "It would be impossible for him at this stage to be 100% sure he will be able to do everything, but that's the plan and there is no reason to think otherwise," said British Athletics performance director Neil Black. If Farah does not compete in Glasgow it would be another high-profile loss for the Games. Home favourite Sir Chris Hoy retired last year, while fellow cyclist Mark Cavendish is injured after damaging shoulder ligaments in a fall during the Tour de France earlier this month. Heptathlete Jessica Ennis-Hill, another London 2012 gold medallist, is also taking time out from competition to have a baby. Jamaican sprinter Usain Bolt, winner of the 100m and 200m at the past two Olympics, will be in Glasgow but says he will only run the relay.